Along with Harold Cardinal, Maria Campbell, Basil Johnston, Rita Joe, and Daniel David Moses, George Kenny is a significant part of the Indigenous resurgence movement of the 1960s and 1970s. Their writings were pivotal in bringing Indigenous political issues to the fore to the broader Canadian public and to an international audience. Kenny’s first book, Indians Don't Cry (Chimo, 1977), is "a landmark publication in the history of Aboriginal literatures in Canada" (Eigenbrod 181). This collection of short stories and poems contains reflections on kinship relations, residential schooling, the arts and political resistance. In 1982, NC press published an extended version of the book and, in 2014, the extended version of the book was re-released by the University of Manitoba as Gaawiin Mawisiiwag Anishinaabeg - Indians Don't Cry. The newest version contains Anishinaabemowin translations by Patricia Ningewance. Typically described as a book concerned with the effects of residential schooling on Indigenous communities and their families, it can also be read through the optics of Indigenous survivance as a series of autobiographical portraits, which describe the new historical conditions of life under which Indigenous peoples in Canada currently live and resist. Kenny was born in 1952 in the village of Kejick Bay, home to the Lac Seul First Nation in Ontario. Member of the Bear Clan, Kenny was raised by his parents until he was sent to Pelican Lake Residential School in 1958, where he spent eight difficult years. Despite constant pressure to assimilate, Kenny carried his family teachings and stories on into adulthood. He speaks Anishinaabemowin fluently. In the late 1970s, Kenny left home for Toronto in order to pursue a writing career. There he worked as an editor for Wawatay News, a bilingual newspaper written in Anishinaabemo in and English and as a guest editor for Tawow: Canadian Indian Cultural Magazine. From 1990 to 1995, Kenny was a columnist for the Thunder Bay Chronicle Journal. He has taught creative writing at a variety of colleges. In addition to working as a writer, playwright, editor and teacher, Kenny is an anthropologist specializing in the Anishinaabe people of Lac Seul and the English River. He has worked as archeological assessment consultant for many Aboriginal agencies and helped his community of Lac Seul First Nation settle their flood claim with the Canadian government. In 1929, Ontario Hydro flooded their traditional territory people "without consultation" to build the Ear Falls Damn (Eigenbrod 180). Many families were forcibly relocated. Throughout his adult life, Kenny has served on non-profit Native Community boards. Kenny holds a Bachelor of Integrated Studies (University of Waterloo, 1984) and a Bachelor of Arts (Honours) in Archaeology (Lakehead University, 1997). He is currently working on a Masters degree in Anthropology at Lakehead University. Kenny is married to an ethnobotanist, Mary Bea Kenny, who has been trained in the plants of the boreal forest of the Anishinaabe in both traditional and academic settings. His son, Michael Mahkwa Auski, is a hockey player who holds a Masters of Social Work (Ryerson University, 2013). Kenny adapted Indians Don't Cry into a play titled October Stranger (1978). Co-written with Cree actor Denis Lacroix, October Stranger is considered the "first full-length Native play about contemporary Native people" (Shäfer, qtd. Eigenbrod 179). Composed at the behest of James H. Buller, Cree boxer, opera singer, and founder of the Association for Native Development in the Performing and Visual Arts, the play was performed at the Sixth International Theatre Festival in Monaco, France, in 1977. In 1985, Alan Collins made a film version of October Stranger starring René Highway, Doris Linklater, and Ronalda Jones. 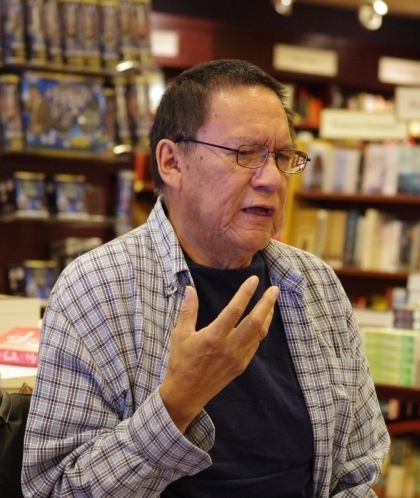 In addition to his publications, Kenny's work appears in several field-forming anthologies such as Penny Petrone's First People, First Voices (1983), Hartmut Lutz's Four Feathers, Poems and Stories by Canadian Native Authors (1992), and Jeannette Armstrong and Lally Grauer's Native Poetry in Canada (2011). In 2017, while hosting a Traditions Workshop, Kenny drolly remarked: "My son and I are writing a sequel to Indians Don't Cry. . . The sequel is called Indians Do Cry." Indeed, there are a series of unpublished works "piled up in [Kenny's] drawers at home" including an unpublished memoir (Eigenbrod 179). We hope one day they become publicly available. Madeleine Reddon is a PhD candidate at the University of British Columbia work. Her work examines modernist and avant-garde Indigenous authors from the 19th and 20th centuries. She has been working on transcribing an unpublished novel from Alootok Ipellie with the People and the Text. Eigenbrod. "Afterword: George Kenny--Anishnaabe, Son, and Writer." Indians Don't Cry: Gaawiin Mawisiiwag Anishinaabeg. Toronto: University of Manitoba Press, 2014. pp: 176-187. Kenny, George. "Christmas Carol." The Native Perspective 2, 1. (December 1976). 27. ---. "Just Another Bureaucrat." The Native Perspective 2, 1. (January-February 1977). 19. ---. "Welcome." The Native Perspective 2, 4. (May 1977). 24. ---. "The Shooting of a Beaver." The Native Perspective 2, 5. (July-August 1977). 74. ---. Indians Don't Cry. Toronto: Chimo Publishing, 1977. ---. October Stranger. Written in collaboration with Denis Lacroix. Toronto: Chimo Publishing. ---. "The Drowning." The Native Perspective 2, 10. (1978). 30. ---. "I Don't Know this October Stranger." Tawow 6, 2. (1978). 6. ---. Guest editor. Tawow: Canadian Indian Cultural Magazine 6, 2. (1978). ---. Guest Editorial: "Northwestern Ontario.... The People Then and Now." Tawow 6, 2 (1978). 6-7. ---. "Soft and Trembling Cry." Canadian Fiction Magazine 36/37. (1980). 21-5. ---. Indians Don't Cry. Revised and expanded edition. Toronto: NC Press, 1982. ---. "The Bull-Frogs Got Theirs (as now I do)." First People, First Voices. ed. Penny Petrone. Toronto: University of Toronto Press, 1983. 188-9. ---. "Note to Carl Ray from George Kenny." The Sound of the Drum: The Sacred Art of the Anishnabe. ed. Mary E. (Beth) Southcott. Erin, Ontario: Boston Mills Press, 1984. ---. "Whee-skay-chak and Kah-kah-ge." Four Feathers, Poems and Stories by Canadian Native Authors. ed, Hartmut Lutz. Osnabruk, Germany: VC Verlags-Cooperative, 1992. ---. "News Girl." Ontario Indian 5, 4. (May 1982): 37. ---. Selected poems in Native Poetry in Canada: A Contemporary Anthology. ed. Jeannette C. Armstrong and Lally Grauer. Peterborough: Broadview Press, 2011. 193-8. ---. "How He Served". Studies in Canadian Literature / Études en littérature canadienne. 31, 1. (2006). 49. Collins, Alan, dir. October Stranger. Toronto: R.C. Ellis Enterprises, 1985. Däwes, Birgit. "Reaching for the Same Can of Beans: Transnational Indigenous Performance in the U.S. and Canada." The Routledge Companion to Inter-American Studies. ed. Wilfried Raussert. Routledge, 2017. pp: 143-149. ---. "The Oral in the Written: A Literature between Two Cultures." Canadian Journal of Native Studies, vol. 15, no. 1, 1995, pp. 89. Please contact The People and the Text at people_text@sfu.ca with any comments or corrections.